Models IP411 and IP413 accept 4-20 mA, 0-10 V and 0-5 V signals and convert these analog signals to proportional linear pneumatic outputs (3-15 or 0-20 psi). Unlike other units which bleed air to maintain pressure, the IP411 and IP413 use a silicon pressure sensor and an electropneumatic converter to provide the desired pneumatic pressure without constant air consumption. 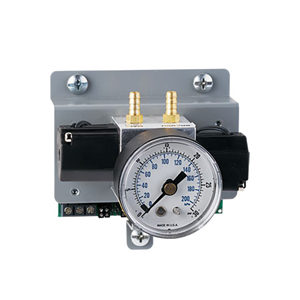 The converter’s unique design eliminates common problems such as hose chatter and needless air consumption from air leaks caused by heat, age, moisture, contamination, mounting, orientation error, sticky valves, valve leakage and blockages. The IP411 and IP413 provide a reliable, repeatable, and accurate means of converting an electrical signal into a pneumatic pressure.